Shipping office to new place is more stressful task from normal home relocation. Office shifting includes handling of large amount of sensitive electronic stuffs, heavy and bulky furniture and critical data in form of files and documents. It also directly effects over one’s business so must be completed as soon as possible. So don’t worry HS Packers Movers provide Office Relocation Services and offer this service at the market leading prices to our priceless customers. The summary of the services which is provided by HS Packers Movers are: Pre-Move Survey of office (Old as well as New Office), All Departments Survey, Estimating volume & types of items, Scheduling of Work (Weekends/ Holiday to minimize work loss), Packing of Goods, Loading into Transportation vehicle, Insurance of goods, Transportation to new location, Unloading of goods from the trucks, Unpacking of goods, Final rearrangement of your items so that on next working day there is no problem at all. Packing and Moving Service for office goods movement requires original quality packing while shifting office goods from one workplace to other workplace. HS Packers Movers manages all the rearrangement regarding staff items similar to computers, files, cabinets, desks, sitting revolving chairs, fax machines etc. These items could be more depending upon the nature of the office/company to be shifted. If you want to rearrange all the things by yourself so you can do it by your way, and when you need any help that time our experts will help you in this rearranging process. HS Packers Movers better understand this characteristic of office shifting. This is the reason that HS Packers Movers in Vadodara (Baroda) employ our most proficient manpower and best equipments to accomplish this duty. Whenever any responsibility came to us, we first of all do a appropriate survey and then only start the work to keep away from any kind of disruptions, which may arise at a later stage. HS Packers Movers in Vadodara (Baroda) offer the service at the market leading prices to our priceless customers. Some of the organization has important machinery and electronic items which require heavy and well-organized labor for loading and unloading, occasionally it’s very difficult for labor also for that movers and packers uses crane for lifting office apparels and setting them to vehicle or truck i.e., Trailers. HS Packers Movers in Vadodara (Baroda) have all the present technique of relocating commercial office goods. 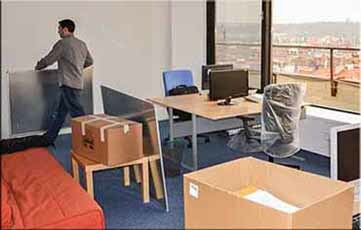 Office relocation also known as office shifting or moving, it comes under the grouping of marketable packing and moving. When we imagine of moving whole office goods at same time it seems really insensitive job to do but with HS Packers Movers which is available in Vadodara (Baroda) who always shift office goods and objects construct and you’re shifting very easy with packing and moving service of office goods. It’s very complicated for someone who is not habitual of packing office goods and moving to new office place and more of shifting with causing no damage and delivering goods at time headquarters systems are need to be set for work at time.